A sweetly struck drop goal by flyhalf Jonny Wilkinson one minute from the end of extra time gave England a dramatic 20-17 victory over Australia in an epic rugby World Cup final on Saturday. A match of escalating tension and unremitting intensity was appropriately settled by the best flyhalf in the tournament on a night of driving rain at the Olympic Stadium in Sydney. Australia, the defending champions, had fought back from 14-5 down at half-time to level the scores at 14-14, but after scrumhalf Matt Dawson had run deep into Australian territory, England systematically set up a position for Wilkinson. All the Wallabies could see what was coming, but they were powerless to prevent the ice-cool left-footed standoff kicking the most important goal of his life with his right boot. The game, only the second final to go into extra time after the 1995 clash between the Springboks and the All Blacks, was not just the greatest of the five finals to date, it was also a rugby classic. In addition, England became the first team from the northern hemisphere to win the World Cup before a record crowd for a rugby match of 82,957. They also entered sporting legend as the first England team to win a major team trophy since the 1966 soccer World Cup-winning side led by Bobby Moore. "It was a huge effort by the entire squad of players, coaches and backroom staff, everybody. Thanks to the fans, they were incredible," said captain Martin Johnson, who had a colossal game at lock. "I can't say enough about the team, because we had the lead and we lost it, but we came back and Wilko at the end, I can't say enough about it." England, who had beaten Australia in their last four matches, took a 14-5 lead at half-time after both sides had scored a try apiece. Led by Johnson and his magnificent forward pack, they then dominated possession in the second half on a treacherous pitch after two days of heavy rain before Wallaby coach Eddie Jones produced a tactical master stroke. Jones brought on his reserve locks, David Giffin and Matt Cockbain, and suddenly Australia began to dominate the lineouts. Centre Elton Flatley, dropped from the Wallaby side this year after failing to turn up for training after a night of celebration, also kicked two penalties to put Australia only three points adrift. With two minutes of normal time remaining, South African referee Andre Watson penalised England for illegal scrummaging. Flatley lined up the ball on the 22-mark and kicked the equalising goal. Two minutes into extra time, Wilkinson kicked his fourth penalty from 45 metres and the teams turned around with England leading by three points. With four minutes left, however, England number eight Lawrence Dallaglio was penalised for hands in the ruck and Flatley levelled the scores again. But England were not to be denied. With implacable self-belief, their magnificent forward pack surged ahead and Dawson made the crucial break to set up Wilkinson, who had missed with three previous drop kick attempts, for the match-winning goal. Australia, seeking to win the World Cup for a third time and thus make the Webb Ellis trophy their own for ever, had made the perfect start, scoring a try after only six minutes. From a scrum near the 22, flyhalf Stephen Larkham hoisted a perfect up-and-under for Lote Tuqiri's wing. As the ball hovered just short of the line, Tuqiri out-jumped the smaller Jason Robinson and crashed over triumphantly for the try. 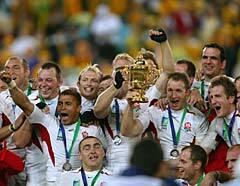 Wilkinson replied for England five minutes later when he slotted the ball through the uprights with a 45 metre penalty. He kicked another from almost the same spot and the third from the 22 mark. In the 38th minute, Dallaglio, who had a magnificent game at number eight, burst through the Wallaby defence and fed Wilkinson. Wilkinson swept a medium-range pass to Robinson who went scampering away to score in the left-hand corner. England should have been further ahead, but lock Ben Kay dropped the ball with the line at his mercy after Dallaglio had kicked ahead to set up the perfect attacking platform.